The Problem with Pearls by Phyllis McManus is a tender story mixed with the harsh realities that sometimes invade otherwise peaceful lives. Karlee is headed home to North Carolina to bury her mother and to try to start a new life. Recently divorced and now with her mother gone, Karlee will rely on her best friend, Lexie, to help her through. Long kept secrets are revealed in letters that her mother left for her and, as Karlee tries to piece it all together, new people come into her life that she never dreamed she would have. As Karlee's future begins to unfold and take shape, a piece of her past has returned and his name is Wyatt. Can her first love become her new and forever love? Can the mistakes of the past give way to a better future? As Karlee makes startling discoveries about herself and her mother, as truths reveal some of the missing pieces, a whole new life is opened up for her. She finds new family, makes new friends while getting reacquainted with old ones, and her dream career might just happen. McManus’ story is riveting and encompasses many emotions. While one romance has ended, a new one is definitely a possibility. Love, sorrow, anger, and fear are all explored in this tender yet tormented story of survival and rediscovering who Karlee is and what she wants. While managing to accomplish a great deal in a short amount of time, McManus has given us a story of hope and possibilities. McManus explores areas of love and emotional upheaval as well as restoration and healing. This well written and imaginative story draws you in and makes you want to sit back with a cup of tea and go along on the journey with Karlee. 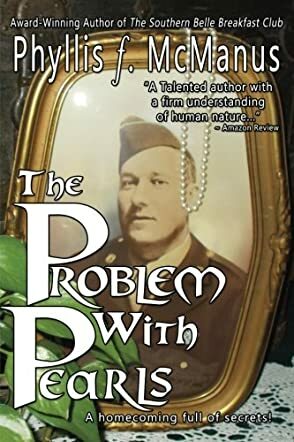 I loved the story and recommend The Problem with Pearls and this author.